This is where koalas live. That dot in the middle of NSW is Narrandera. Here’s a really interesting factoid: there are 680 species of eucalyptus trees and one species of koala. 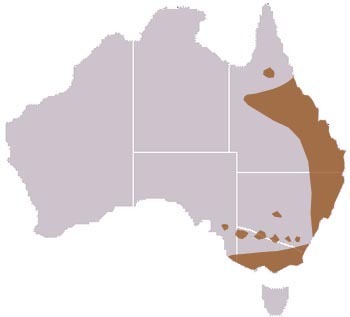 There may or may not be three subspecies of koala with the Victorian ones being the largest and furriest, NSW mid-size, and those in Queensland smallest and least furry. But what is cool is that depending on where they live, they eat different leaves. So in QLD, they eat grey gum and tallowood; southern dwellers eat blue, swamp, and manna gum; NSW koalas like red river gum leaves from swampy areas. And about 100 km north of Wagga, in a town called Narrandera, is a swampy feast of red river gums that is being used to rehabilitate the state’s koala population. It was a big weekend in Wagga – there was a Home Show and the Food and Wine Expo, both of which we packed into Saturday and enjoyed. And we even managed to weave in a couple more open houses. Any of which we could write about (the F & W event will get written about next year), but instead we are today going to focus on Sunday, Gloria’s last day here, when we decided to take her try to find some koalas. On the way, we made a point of remedying the fact that, as she wrote about in her blog, she had yet to see a kookaburra. We had seen some on Saturday morning while cycling, but when we took her to the spot later they were gone. So on our way out of town on Sunday morning (after a quick return home to slap some ointment on the bee sting Dan suffered while fueling the car!) we went to the same neighbourhood and came across a couple of them, getting really good views of one on a wire and another on a sign. The Sturt Highway between Wagga and Narrandera had been closed during the recent flood period and still had water overflowing into the lanes in some places. This, however, allowed us to do some quality birding on the trip – there were water birds in places they shouldn’t have been! So we saw a lot of ducks, coots, grebes, swamphens, and even some black swans swimming along the roadside. 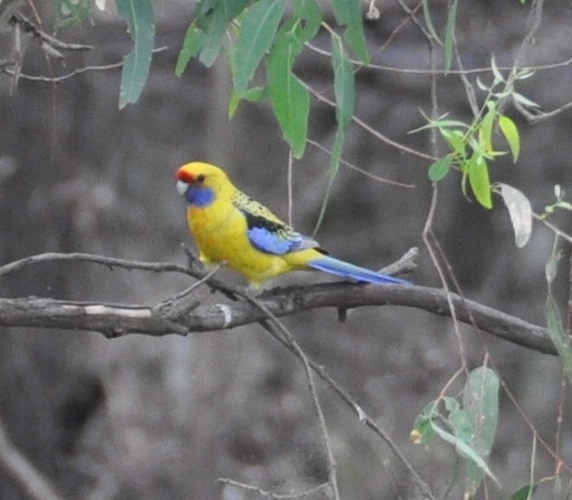 We didn't get a photo of the ringneck, but did get some great views of a few yellow rosellas. When we got to Narrandera, the helpful lady at the tourist info booth told us that the koala reserve was off-limits due to it still being a mucky mess after the floods. She said that if we were interested in birds though, we should go to the wetlands… not a lot of logic there: too wet to go where we wanted to be, so go to the wetter place! 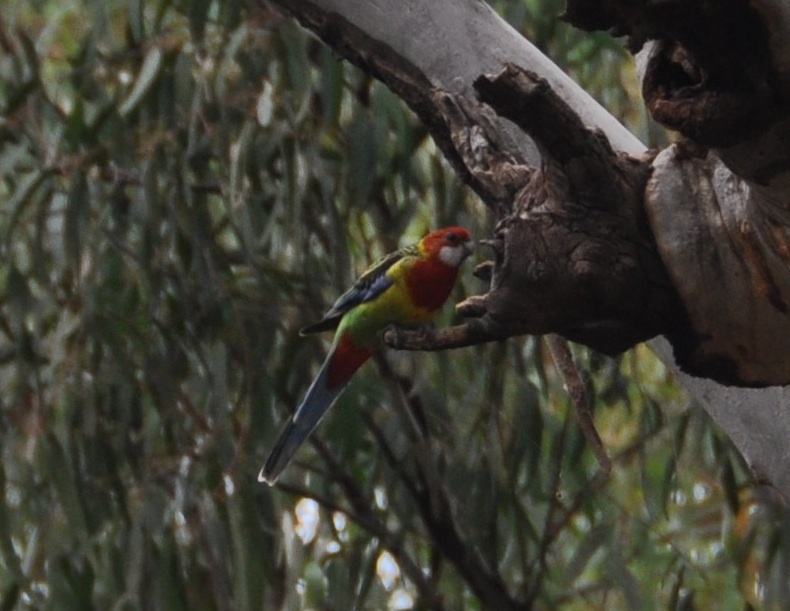 So we did, and had some good luck with a variety of birds including a new parrot to us, the Mallee Ringneck. Then, despite being warned off, we headed toward the koala reserve. A bit of history: a few decades ago, they tried to re-introduce koalas to the region and brought in three. Now, there are about 200 living in the reserve and they don’t know how many have spilled out into the neighbouring woods. All around that side of town there are roadsigns warning of koalas on the roads. And we found that yes, to get to the koala area we would have had to walk a kilometer of stinky mucky trail. So instead, we stayed around the entrance to the area and were amazed at how great the bird life was there. You are all probably getting sick of us bragging about living amongst parrots, but we don't care. Eastern rosellas like this are pretty much a daily sighting! Standing in one spot, we were able to see at least three different parrots, various honeyeaters, two kinds of friarbirds, cockatoos of course, and a few other things. And the best view we have ever had of a kookaburra. This guy just sat on a branch in front of us, even while a willie wagtail harassed him. Dan took way too many photos! In the end, we didn’t find the koalas, but Gloria upped her bird list by at least 10 and we saw a lot of species we hadn’t seen before. And we at least found out where the koala reserve is, because we plan on returning at the end of the month to take part in the annual koala count. How cool will that be?! 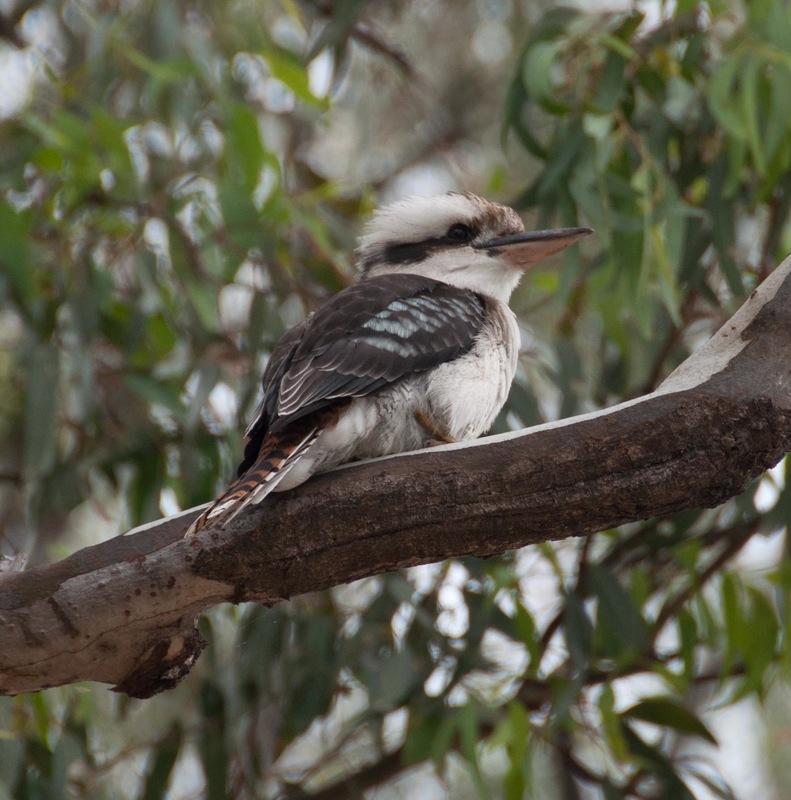 We often see kookaburras at a distance, while driving or cycling, so were thrilled that this one sat on a branch about 10 feet above our heads, for a long time. What a spectacular creature! This entry was posted in birds, honeyeaters, koalas, kookaburras, parrots, Riverina, rosellas, rural life, trees. Bookmark the permalink.